Use to remove oil-based spots & stains such as tar, asphalt, grease, lipstick, crayon, gum, proteins, adhesive, and shoe polish. Leaves a pleasant orange fragrance. Use on carpet and hard surfaces. Because of it's many uses, Advantage Citra-Gel 2.0 spotter is one of biggest sellers for the professional carpet cleaner. 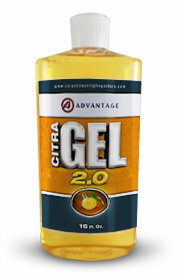 Advantage Citra-Gel 2.0 can also be used around the home especially for spotting clothes. Citra-Gel works great at getting out those stubborn stains like, grass, grease, oils, makeup, etc. Like all gels...this product needs to be thoroughly rinsed!